Rancho Los Baños is truly a world-class hiking ranch, offering spectacular, otherworldly and unspoiled hikes. Our main attractions for hikers, trekkers, backpackers and campers are our many canyons, our scenery and our landscapes. Throughout its 30,000 acre preserve, the ranch has miles and miles of scenic, pristine hiking and trekking, with wide ranges in elevation, distance, temperature, difficulty as well as diversity of ecosystems. From easy to moderate to difficult, each trail offers a diverse set of challenges, as well as experiences. 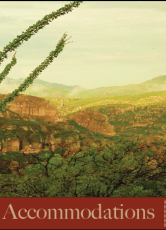 The Sonoran/Chihuahuan desert landscapes, flora and fauna of this region are unlike anything else in the world, with combinations that are both otherworldly and spectacular. With 30,000 acres as your playground, virtually devoid of people or signs of modern life, you are sure to enjoy your journey, whether it be a one hour long hike or a two or three day trek through the ranch’s property. With an elevation range from 3,200 feet above sea level in the Canyonlands to 7,450 foot El Pinito, with middle elevation river beds and rugged hills dressed in golden colored grass in between, the ranch offers hiking and trekking that will surely please every taste and level of experience. 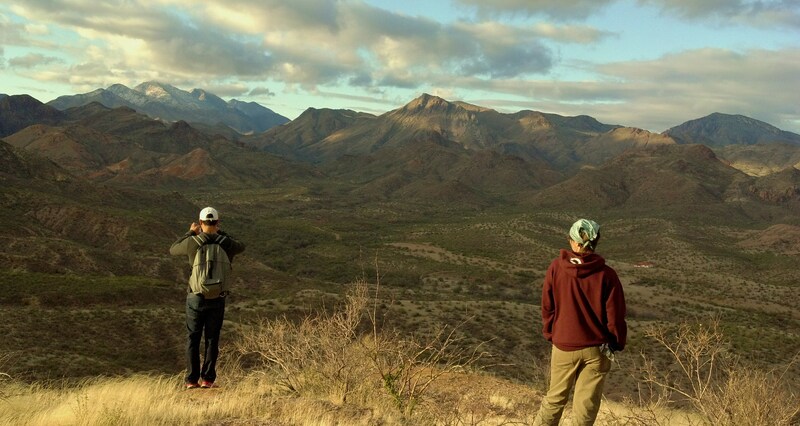 Enthusiasts of the outdoors and of nature will find in Rancho Los Baños’ wide ranging trail system a scenic, untamed and unspoiled landscape of exotic and unique beauty. You will traverse a land as rugged, wild, remote and exotic as anything you have seen, or experienced, with thrills and surprises, not to mention scenery, behind every corner. Whether climbing to the top of El Pinito for miles long, spectacular views of the entire region, while enjoying the cooler temperatures and the crisp, fresh, ponderosa and oak tree-smelling air, or whether you decide to hike the mountain’s foothills, full of mid elevation (4,500-6,000 feet above sea level) canyons such as Land of Puma Claw, right in the middle of mountain lion country, and riparian river beds such as El Palmarito, where you might find yourself in a birding and wildlife spotting paradise, or bumping into a Gould’s turkey roosting site, or coming face to face with a Coues white-tail deer, a bobcat, gray fox, or javalina, the Northern Section of the ranch will not disappoint. This higher elevation offers guests an opportunity to experience the high Sonoran/Chihuahuan deserts environs. In the lower elevations of the ranch, known as the Canyonlands , El Cajon Canyon is a hiker’s dream, and the gem of Canyon Country (please see our page on El Cajon, under Adventures, for more information). Not to be outdone, however, are several other canyons and river beds (more than two dozen distinct canyon hikes), each with its own personality and distinguishing landscape and scenery. Each of these hikes offers guests a surprise at every corner, a different perspective and experience that cannot be found anywhere else inside the ranch, or in the Americas for that matter. Close to Lake Angostura and the Bavispe River are Cajon de la Catedral , (named Cathedral Canyon for its massive concave-like structures), and Cajon de las Piedras (Canyon of the Rocks), both enchanting, miles-long canyons full of adventure and surprises at every turn. These canyons, with their river beds winding and slithering their way through sandstone walls hundreds of feet high, with rock formations, enormous boulders and incredible vistas, are not to be missed and, after El Cajon Canyon, are two highlights for any hiker, with comparisons to Zion and Moab constantly being made. Starting separately, after a few miles they meet and form one indivisible, horseshoe-shaped canyon system. These canyons can be hiked individually or in unison, and they remind the observing eye of hikes in southern Utah, yet with an altogether unique, one-of-a-kind feel and exotic feel. Inside Cajon de la Catedral, full of riparian habitat and desert landscapes, are an assortment of ancient petroglyphs painted on the canyon’s walls. Dated to 2,000 years ago, these paintings offer a different perspective than those found inside El Cajon, at the Cueva Pinta. The glyphs at Cajon de la Catedral offer further insight into what life must have been like more than 2,000 years ago. These paintings are not to be missed, for they represent age-old masterpieces our ancestors created. Most inspiring, perhaps, and among the highlights of the ranch, is the massive natural concave structure referred to as the Catedral, or Cathedral. Its surreal structure and massive dimensions present a hiker with a moment of contemplation, thought and spirituality. The power of the natural world presents itself in this rock formation, carved out of the canyon wall, yet another masterpiece in a work of art that is the Cajon de la Catedral. In addition to the petroglyphs at Cajon de la Catedral, Cajon de las Piedras offers a hike of immense beauty, secluded and hidden from civilization, with an environment only a boxed canyon carved by millions of years of erosion and weathering can provide. Here, you will traverse boulders (climbing over and going underneath them), jump into water holes, see rocks of all shapes and sizes, pass surreal looking trees and other flora that adorn the canyon sides, and glance at a geology that is completely otherworldly. You seemingly will be unable to both watch your step and gaze upwards at the monolithic canyon's walls. You will be in awe at the geologic wonders you are seeing, amid the splendor of hiking inside narrow and three hundred foot tall canyon walls . Jumping rocks, slithering through crevices, climbing 45 degree angle walls, canyoneering through water and natural holes and tunnels, climbing boulders and hiking through an incredible landscape, you will find yourself immersed in a beauty that is hard to replicate in photographs and video, a unique adventure only to be found at Rancho Los Baños. These two boxed canyon hikes, moderately challenging after a little bouldering, yet quite an adventure for hikers of all skill levels, is stunning and spectacular, an experience a hiker has never had, with views she has never encountered, with sights, sounds and smells that are as alien and exotic as the rock walls themselves. Cajon de la Catedral and Cajon de las Piedras will leave you in awe at the power of time and forces of Nature. In many ways, Cajon de la Catedral and Cajon de las Piedras are second to none, an adventure unlike any other, not to be missed. Cajon Aguaje, within 300 yards of the ranch’s base camp and sharing the same river bed as El Cajon, though located just north of El Cajon, is a wonderful hike through a boxed canyon full of sights, sounds and spectacle. Inside you are likely to see owls perched atop canyon walls and a group of 20-30 coatimundi scurrying up the walls as you approach. You will see rock formations and cliffs that are geological wonders. In time, the boxed canyon gives way to the openness of rugged hills and terrain as the river bed you are on slowly slithers its way past miles of wild country until it reaches the higher elevation of Land of Puma Claw, near El Pinito. Offering prehistoric-like scenery, serene tranquility and a hike well worth your time and effort, Cajon Aguaje, which means “Water Spring Canyon,” is home to the ranch’s hacienda’s water supply. The natural spring that emanates from inside the canyon's walls supplies base camp with water that has run continuously for more than five decades. It is a canyon of impeccable beauty and one that combines both boxed canyon and rugged hill country scenery and habitats. El Alamo River Bed and Riparian System, another outstanding hiking and trekking experience, is a miles-long river bed expedition that also serves to connect Los Guajolotes habitat, Tierra Palmas and Tierra del Ocotillo. Eventually, El Alamo connects with El Palmarito as well. In this river bed habitat, you will find much of the character that makes the southwestern section of Rancho Los Baños what it is. This hike takes you through open air scenery, without the confined space of boxed canyon trails, and into prehistoric looking landscapes full of sights and surreal combinations of flora. You will be exposed to large and small mountains, rock formations, small canyons and a diversity of flora that is a treat to see. In its entirety, El Alamo riparian river bed traverses the true essence of the Sonoran and Chihuahuan deserts, showcasing a world of rugged wilderness that makes this land unique. In the southern entrance to El Alamo, in the Tierra del Ocotillo, you will be immersed inside a virtual forest of ocotillo plants, spreading their tentacle-like branches in green splendor, each distanced apart perfectly as if Nature had hired an expert landscaper. As you approach Tierra Palmas you will see the rugged hills and small mountains of the southwest part of the ranch. Some of these are dotted with clusters of desert palm trees that appear out of place, as if they do not belong . Yet hundreds of these palm trees call this section of the ranch home, exotic reminders that even in deserts, diverse habitats can be found anywhere. The Land of Palms seems as prehistoric and wild as anything inside the ranch, and a hike through the river bed that dissects this land allows a hiker to experience wide open vistas of this amazing land. For those seeking even more riparian river beds, with opportunities for great sights and birding, Los Guajolotes, or The Turkeys, offers hikers the chance to veer off the path. This river bed branches off El Alamo and heads west, reaching the western edge of the ranch’s border.